This year I've decided to approach party dressing from a whole different perspective and I've been road testing those perfect items to buy now, once and for all. The term "investment piece" can often seem a little gimmicky but in a world where substanibility is hot on everyones lips (rightly so), we have less and less time to plan for Christmas outfits and let's face it money is often tight I feel like it's high time we approach seasonal dressing with a little more logic. So once more I lend my fellow party-wear novices a helping hand. Let's look at the ultimate winter wardrobe staples you should be hedging your bets on this year (and the next and the next and... you get the idea). This year I've gone wild for belted jackets and Christmastime certainly doesn't offer this trend any respite. My ultimate item to invest in for now and forever is the velvet belted jacket. 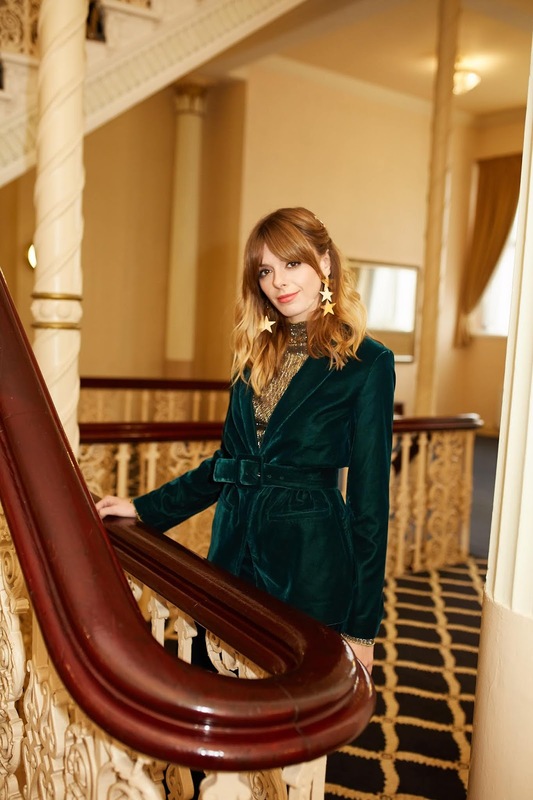 As wonderfully demonstrated by well... me in this post, you can see the belted velvet jacket is insanely versatile and I've paired it with two entirely different outfits just to prove this point. I spoke last week about the perils of trying to find a perfect winter evening jacket so just an FYI, the velvet blazer is your quick fix answer to this conundrum. 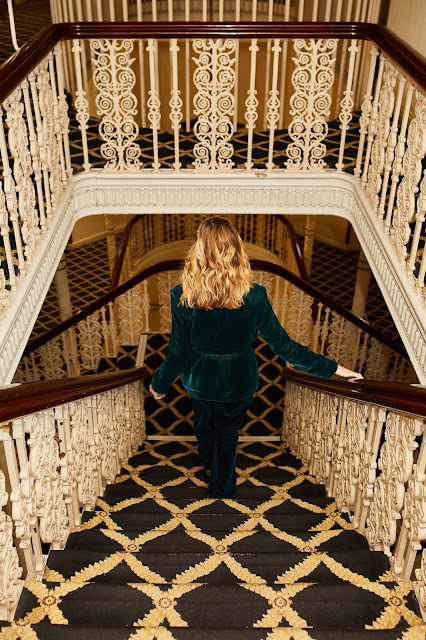 Velvet and Christmas go together like mince pies and brandy sauce and it's a material which appears in the shops year after year proving it to be nothing short of timeless. I guarantee that any velvet jacket you purchase this year will last you for a dozen Christmas's to come! It won't date and it will be incredibly versatile. Now the belted detailing on a velvet jacket is a whole different- very wonderful- kettle of fish all together. Not only is a belt super flattering on any figure, cinching you in at your smallest part (at the risk of sounding a little Gok Wan) but it suddenly makes your jacket incredibly changeable from outfit to outfit. Take my two outfits in this post- In one look I've pulled my And Other Storie Belted jacket in as much as possible to create a very adronyndous, tailored feel to my outfit. Whereas in the other look I've worn the jacket loose with the belt tied around the back, highlighting the detail of my Whistles jumper and giving the overall outfit a more feminine, laid back vibe. One look is super glam whereas the other is ideal for a low key (kinda) festive dinner. Not only is this style of jacket interchangeable in shape but in occasions. Simply wear it over the top of your favourite party dress or with a roll neck and jeans for a casual, daytime feel. Treat this kind of outerwear as your would a leather jacket- it's universal and completely adaptable. 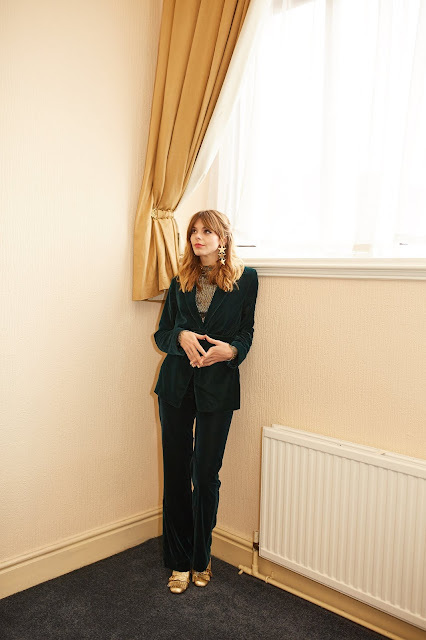 In a mere moment I will suggest my next two Christmas investments which can easily be styled with a velvet blazer but what I would add is if your dream velvet jacket conveniently comes with matching trousers (as with my And Other Stories Trousers) than it's well worth making the bold purchase of both. 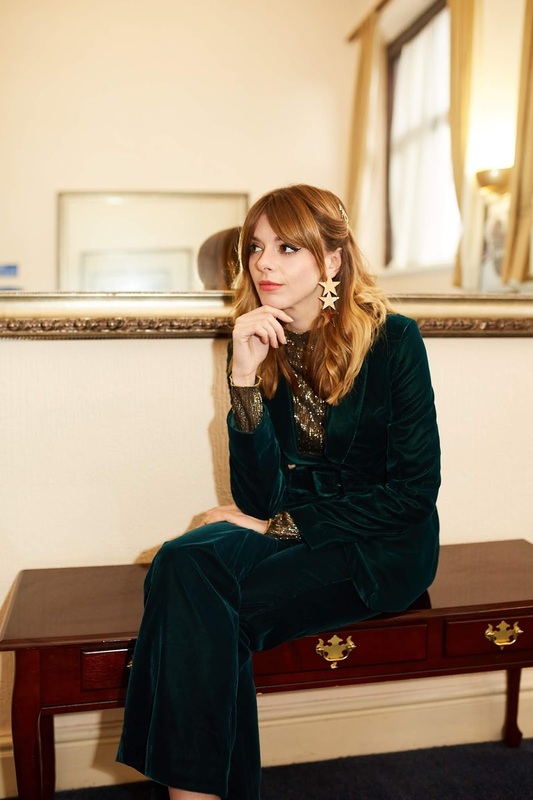 Not only will your new velvet two piece suit make a quick, easy and effective outfit all on its own but you're left with two items which separately make great outfit builders throughout the holiday season. Oh and just one last FYI... Velvet trousers are generally so, so, SO comfortable. Perfect for over indulging in a turkey sandwich or two (or five). One of my all time favourite pieces for the winter season- a good old sparkly knit. Now this was one of the pieces I advised on last year so I won't ramble on too much but what I will say is if you're not one for glitzy dresses or spangly blouses than a Lurex knit is the seasonal piece for you. Not only will it do the trick for making you look super festive but you'll be well within your comfort zone. More over if like me, you just can't bring yourself to get onboard with the Christmas jumper trend than a glitter knit will be your happy and much more chic compromise! 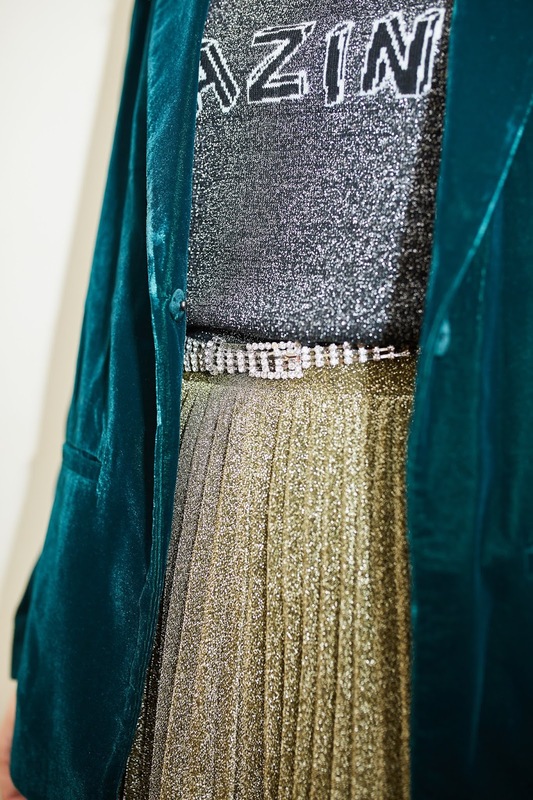 It doesn't take a genius to work out that a glitter knit is pretty much wearable with any outfit and for any occasions, it's simply a jumper with a little bit more flare! I'm not going to start listing the pieces to wear it with because we'd be here all day. Just know that the slogan lurex knit is one of the items which has appeared on the high street continually over the past few years (with my favourite this year being the Whistles Star Gazer jumper featured in this post) and subsequently has now made my list of top festive pieces to invest in for this year and forever after! Truth be told I have a teeny tiny obsession with metallics, mainly silvers and golds. Shoes, bags and as this post would prove, skirts! But please believe me when I say there is method in my madness! You see the funny thing with both silver and gold is as glam and glitzy as they may seem, they are in fact both such amazingly neutral tones. You'd honestly be surprise at how much they actually go with... In fact I'd go as far as to say you could name any colour and one of these metallic tones will not only match it BUT compliment it perfectly. This reasoning alone is why I've gone with not just any old midi as my staple but the metallic midi... That and there's nothing like a bit of gold/silver for the ultimate festive feel to any outfit. Now for me the midi is the perfect alternative to the party dress which can often make me feel a little self conscious and uncomfortable. Party dresses are maybe a little TOO party ready for me... As painstakingly obvious as that sounds. Instead I like to opt for the midi skirt, as not only will it give me that super elegant, very dressy feel I'm looking for but it's completely non-committal! Unlike the party dress which is effectively putting your money all into on one look and one look alone, the midi allows you to play around with your outfit. It's completely adaptable which is a pretty appealing prospect to any partywear-phobe, you can easily make the midi completely your own and style it as dressy or as carefree as you like! In this post I've featured the Whistles Gold Metallic pleat midi skirt in a very party ready look teamed with copious amounts of glitter and sparkle however the week previous I wore the exact same skirt shopping with a chunky purple knit and my beloved Converse. This metallic midi should be treated the same as a black velvet skirt. This is definitely a seasonal item but one which is used to build an outfit not rule it. Wear it on Christmas day with the family or glammed up on New Year after one too many drinks. My biggest bug bear is feeling out of place in an outfit and in the past I've often found this occurs whenever I dress for parties. Evening attire is not strictly in line with my style and so buying items in this arena can often seem a little like a waste. But it really doesn't have to be about buying one set item for one specific occasion! Simply find those versatile, oh so flexible pieces which work for you not just for the party. This season stick with those timeless hero staples that you won't just wear yearly but weekly throughout December.